After talking with both Don London and Summer Richardson about their achievements Saturday in the Desert Storm Poker Run Shootout in Lake Havasu City, Ariz., it’s hard to tell who’s more proud of whom—but being a father of two girls myself, I’m going to have to give the nod to Don on this one since he’s awfully proud of his daughter and her ability to run a boat. 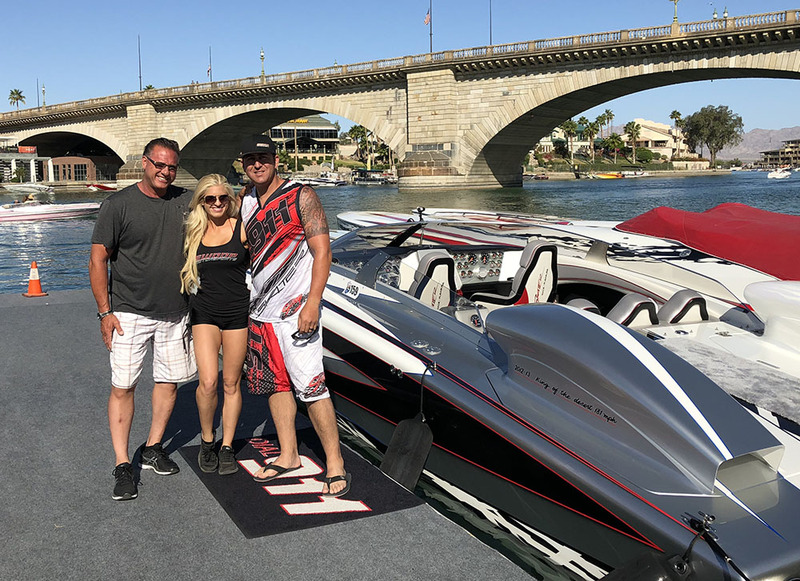 Then again, Richardson was extremely proud of how much work her father put in alongside engine guru Carson Brummett to get his Dial 911 Skater Powerboats 388 catamaran ready to lay down a jaw-dropping overall-best 185 mph on the event’s new three-quarter-mile course. And while she was 32 mph off her father’s clip after they switched out the seats so she could run Dial 911, Richardson still rattled off an impressive 153-mph pass—she told her mom, Connie, she’d keep it around 130 mph after pushing it up to 176 mph on Desert Storm’s one-mile track in 2016 so she might have some explaining to do. Kidding aside, the fact that the father-daughter team from Southern California kept its focus after a very busy week of events and hosting friends and family members was pretty impressive. And it’s not the first time it’s happened. In 2013, the daughter and father earned the Queen and King crowns when Richardson ran 138 mph in a DCB F32 catamaran powered by twin Teague Custom Marine 1025EFI engines and London ran 180 mph in the 38-foot Skater that was powered by twin 1,800-hp supercharged Brummett Marine engines back then. Nowadays—as of about a week ago—the Dial 911 Skater is powered by a pair of Brummett’s latest-and-greatest new turbocharged offerings that make between 1400 hp and 1900 hp, depending on the fuel. According to London, on 91- and 100-octane fuel, the engines produce 1425 hp and 1680 hp respectively. On ethanol, the engines make about 1,900 hp. “We opted for a slightly smaller turbo than we could have for the simple fact that we wanted more drivability downstairs,” London explained. “We went with a 14-pound window in a wastegate combination. We’re not pulling the same rpm as we did with the PSI engines—I went though the radar trap at 8,000 rpm; we used to be about 8,200 rpm—but the boat gets on it so quick. The drag racer in me loves acceleration. I left the start gate at 28 mph, let the boat roll up and stuck the throttles down, and the feeling was incredible. We chose a little larger prop than we used for the poker run, and while it felt a little wiggly at first, the combination settled down and was perfectly planted at speed. London, who is toying with the idea of participating in Central Missouri’s Lake of the Ozarks Shootout in August, gave a lot of credit to Carson Brummett for allowing London into his shop to work on the project for several weeks. London also credited the supportive team behind it all, including his son-in-law, Travis Richardson, and his youngest daughter, Bree London. 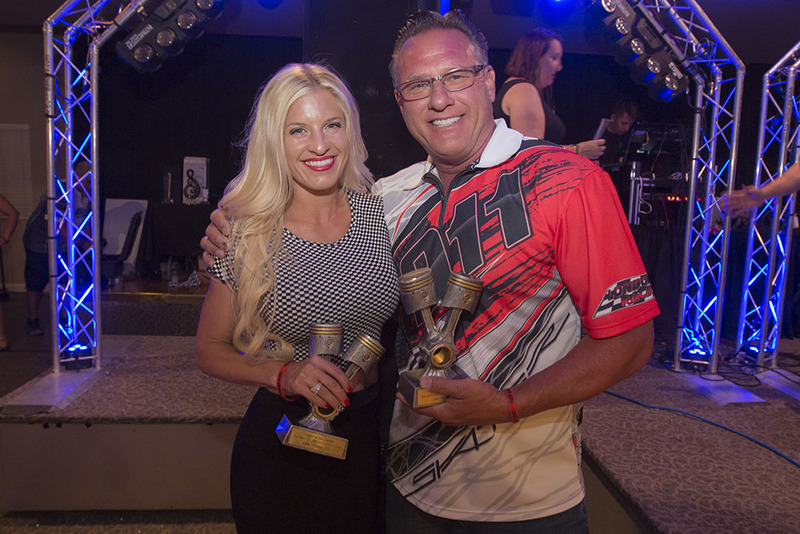 Along with excellent weather and a strong showing of spectators, Richardson said Saturday’s top-speed event is one she will never forget thanks to her and her father repeating as Queen and King of the Desert. She also won’t forget it because the course was closed early after rescue boats were dispatched to a fatal boating accident unrelated to the Shootout (read the story here).